Want to know about group discussions of SSB interviews? All candidates need to discuss on a given topic during their interview. Check out best tips to crack SSB group discussion test. SSB interview spans about five days. There are numerous tests conducted by SSB board officials to test whether a candidate is fit for recruitment or not in Indian armed forces. To crack SSB interviews, all candidates must excel in group discussion tests. 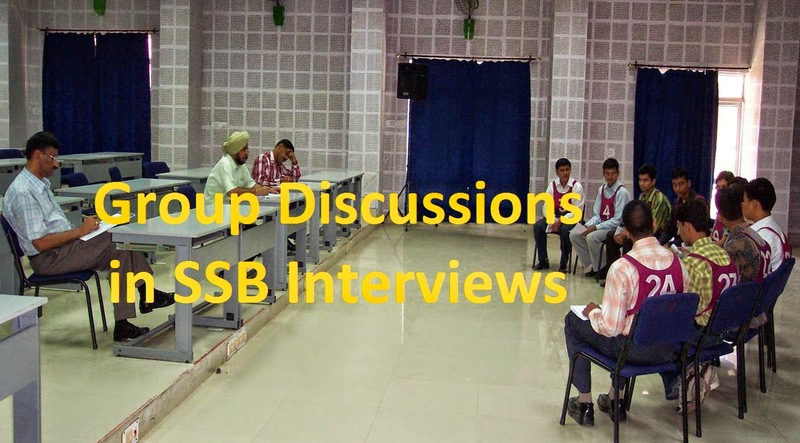 How and when group discussion tests are conducted in SSB interviews? In general, group discussions are conducted on the third day of SSB interviews. Group Training Officers (GTOs) are responsible for testing the candidates during the GDs. Discussions in a group will bring out various Officers Like Qualities (OLQs) in candidates. During a group discussion, all candidates will be seated in a semi circle. In a batch,there will be ten to twelve candidates in SSB interviews. But this number may also increase up to twenty candidates per batch as per the total strength of SSB interview. GTO will sit in the backside of the semi-circled group. Also there may be two to three psychologists sitting and observing activities of each individual of the group during their discussion. GTO will brief the group about the group discussion test in brief. Generally, group members will have to choose a discussion topic between the given two topics by GTO. For choosing a topic, two to three minutes will be given. So during these two to three minutes, candidates need to discuss among themselves and bring forward a topic to proceed with group discussion test. If a group can not come to a final decision about the topic to discuss, then GTO will give the topic according to his wish. Total ten to fifteen minutes will be given to discuss about the topic. During the group discussion during the SSB interview, all candidates should involve themselves in the discussion. Generally, group discussion topics will be of current affairs or topics related to relationships between neighboring counties of India. Candidates should not become aggressive during the discussion. Also it should not look like a debate. You should discuss and bring forward the solutions or probable developments in the related issues. Following are the most frequently asked topics in SSB interviews for group discussion tests. Group discussion is one of the best tests of SSB interview to score good marks. But to achieve good impression with psychologists, we recommend all the candidates to keep the following things in their mind. Concentrate on the given topics while the GTO of SSB interview announces the topics. Keep your voice at moderate level. Don't shout and don't murmur. Try to motivate the whole group to choose your desired topic at the beginning. To motivate the group never try to argue adamantly. After the topic has been finalized, quickly chart out all points related to the given topic. Once the GTO tells to start, try to initiate the discussion. Initiator of a group discussion carries few points and will become a strong contender. If you are not able to initiate then don't worry if you are able to speak at second or third turn also will help you in getting good points. After the initiation, candidate needs to continuously participate in the group discussion to impress the SSB interview psychologists and GTOs. Don't look at the GTO or other psychologists while participating in the group discussion. Don't argue on your point. Remember that it is not a debate where you argue on your opinion. Try to make eye contact with all members while you are speaking. If a candidate will keep the above mentioned group discussion tips in his mind, he will be able to impress the officials and thus have bright chances of being recommended by SSB board. If you have no idea about a group discussion, please go through our recommended books for excelling in SSB interviews. Following are few best books on SSB group discussions. Reading books on current GD topics will definitely help you to achieve success in SSBs. So go through the books and prepare yourself for group discussions. There are many students who are unaware of SSB interview group discussions. To help out such candidates we have embedded few best examples of SSB interview group discussions. So watch the group discussion videos carefully and listen to the points jotted out by the narrator to gain good exposure on SSB GDs. Here is another sample SSB group discussion topic demonstrated. So now I hope you have got good exposure of SSB group discussions and also got an idea about best GD topics for SSB interviews. So prepare well and touch the sky with glory.